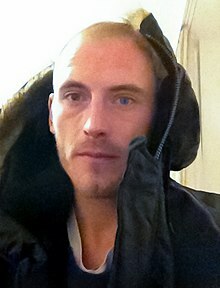 Zachary Charles Hill (born December 28, 1979) is an American multi-instrumentalist and visual artist. 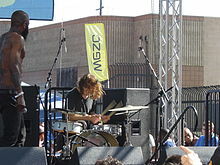 He is best known as the drummer and co-producer of the group Death Grips and math rock band Hella as well as the alternative dreamrock band Team Sleep. His intense, high tempo drumming style is his key hallmark. In addition to music, Hill is also a visual artist. He published a fully illustrated book, Destroying Yourself is Too Accessible, which included the Zach Hill and Holy Smokes album "Masculine Drugs" Released in 2004 on TNI books and Suicide Squeeze Records. The Sacramento, California art space Fools Foundation ran an exhibition of Hill's art, titled "Poltergeist", from April 1 to 29 in 2006. Parts of the exhibit are visible in the photos accompanying Hill's article in the August 2006 issue of Modern Drummer and on the Fools Foundation website. Hill was said to be working on an original feature film in 2013, which was confirmed to feature late actress Karen Black in a leading role. However, she had died before the film could come into full fruition. A shortened excerpt of the footage was posted on the Death Grips Youtube account in October 2015 in a 15 minute video entitled Bottomless Pit. It has been rumored that either Death Grips or Hill's side-project, The I.L.Y's, would be involved with the soundtrack of the film as well. Hill (right) and MC Ride performing as Death Grips. ^ "ZODIAC DRUM KILLER Zach Hill on Blurt Online". Blurt-online.com. December 9, 2008. Retrieved October 18, 2011. ^ "April 2006". Foolsfoundation.org. Archived from the original on July 26, 2011. Retrieved October 18, 2011. ^ Pelly, Jenn (May 10, 2013). "Death Grips to Soundtrack Feature Film Directed and Written by Zach Hill, Working on New Album". Pitchfork. Retrieved May 10, 2013. This page is based on the Wikipedia article Zach Hill; it is used under the Creative Commons Attribution-ShareAlike 3.0 Unported License (CC-BY-SA). You may redistribute it, verbatim or modified, providing that you comply with the terms of the CC-BY-SA.